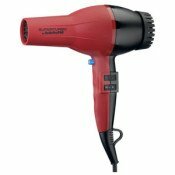 BaByliss Pro SuperTurbo hair dryer delivers 2000 watts of power. The SuperTurbo hair dryer has 4 speed/temperature settings, removable filter, instant cold shot button and a 9 foot power cord. Includes a concentrator nozzle for pin-point styling. Free shipping.